The 310MW Lake Turkana wind project is located in the Loyangalani district of Kenya. The wind power project also includes the construction of 428km-long transmission line. LTWP signed financing agreements with African Development Bank and other lenders in March 2014. The €625m (approximately $858m) wind farm is being developed by Lake Turkana Wind Power (LTWP) consortium comprising KP&P Africa, Aldwych International, Danish Investment Fund for Developing Countries (IFU), Vestas Wind Systems (Vestas), Finnish Fund for Industrial Cooperation (Finnfund) and Norwegian Investment Fund for Developing Countries (Norfund). The environmental impact assessment for the project was completed and licence granted in July 2009. Construction work began in November 2014 and is expected to be completed in 2017. "The wind farm is estimated to supply approximately 1,250GWh of clean electricity to the Kenyan national grid a year." The wind farm is estimated to supply approximately 1,250GWh of clean electricity to the Kenyan national grid a year, which will be equivalent to approximately 16% of electricity generated in Kenya. It will annually offset 16 million tonnes of CO² emissions. The LTWP project is being developed on a 162km² site in Loyangalani District of Marsabit West County, approximately 50km north of South HorrTownship. 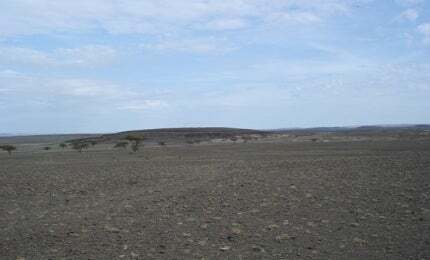 The wind farm site lies 450m at the shore of Lake Turkana and 2,300m above sea level at the top of Mount Kulal. The wind farm will comprise 365 Vestas V52 wind turbines with a name plate capacity of 850kW each. Each variable-speed pitch-regulated upwind turbine with a 52m rotor diameter and a 44m hub height will offer a swept area of 2,124m². The blades are made of glass-fibre reinforced epoxy (Prepreg) and the turbines are equipped with Vestas’ OptiTip pitch regulating system, which regulates the blade angles according to wind conditions for optimised power production and noise levels. Power generated by each turbine will be gathered at a 33kV-collecting grid using a 0.6kV / 33kV step-up transformer. The collecting grid will be connected to a power transmission substation at the project site from where the electricity will be transmitted to the national grid at Suswa substation located 80km north-west of Nairobi, through a 428km long double-circuit 400kv transmission line. The overhead transmission line being built by state-owned Kenya Electricity Transmission Company (Ketraco) will pass through Baragoi, South Horr, Marti, Morijo, Longewan, Rumuruti and Olkalau. Kenya Power (KPLC) has entered into a long-term power purchase agreement (PPA) to purchase the entire power generated at LTWP at a fixed price over a 20-year period. The major pre-construction works for the project include the upgrading of the existing 204km-long road from Laisamis to the farm site, and the construction of access road network in and around the site for construction, operations and maintenance and the construction of three flood bridges. The Lake Turkana wind farm is being financed through a combination of senior debt (70%), equity (25%) and mezzanine debt (5%). Completion of debt financing for the project was announced in March 2014. The group of lenders comprised the African Development Bank (AfDB), European Investment Bank (EIB), the Standard Bank of South Africa, Nedbank, FMO, Proparco, East African Development Bank, PTA Bank, EKF, Triodos, US Overseas Private Investment Corporation (OPIC) and DEG. AfDB is the mandated lead arranger for the project, after agreeing to provide a €115m loan, whereas Nedbank Capital of South Africa and Standard Bank of South Africa are the co-arrangers. Vestas is the supplier of wind turbines for LTWP and will also provide plant maintenance services for an initial period of ten years. Mott MacDonald is lenders’ technical advisor for the Kenyan project. Siemens was awarded the contract for the construction of electrical collection network and substations. Netherlands-based KEMA was engaged as the engineering consultant for the transmission project. Ketraco awarded the €142m ($185.75m) engineering, procurement, construction and commissioning (EPC) contract to Spanish company Isolux Corsán for the construction of the 400kV transmission line. LTWP commissioned Norwegian firm DNV GL as the engineer for the electrical network connection.